Welcome - It's good to be back here - I have been MIA as we have been visiting some very important little people - our grandchildren. This card was made in a hurry with some of the 'experiments' that had accumulated on my desk. The most difficult part was selecting the background paper and card! This was made using watercolour crayons on watercolor paper, heavily spritzed with water, then sprayed with lemon glimmer mist. The butterfly was cut using a Marianne die, and had Kindy Glitz and pearls added. The sentiment was gold embossed on a scrap of the water colour block. Both layers were mounted on black card before being layered over dp. The ribbon was embellished with triple bows of ecru pearle thread. As I do not have a bow-easy, i use my fingers to make the loops - fiddly, but it works. Stampn'Doodle - Embossing of Any Kind. McMahon Digital and is entitled All Things. I wanted to use it for a masculine card, so this is a little less 'frilly' than some cards I have made. As I wanted the image to take centre stage I printed it fairly large, and cut it with a Labels 10 die and sponged the edges with a dark gray ink. The image was mounted on a lime green card that has a discrete sparkle in it, the edges were sponged with a green ink, and then that was mounted onto a dark green card stock. The hand died seam binding ( a RAK from Lovely Linda) and the rhinestones were the final touches. Once again I invite you to visit the other team members and see the wonderful releases there are this week - their names are linked on my side bar. Thanks so much for visiting - may your day be blessed. Greetings and welcome - thank you so much for visiting. Monkey Business by Studio 313. Isn't he just so cute?? There are a variety of sentiments with the set - I printed this one, cut it with an oval spellbinder die, sponged it while it was still in the die, and mounted it over a scalloped oval. I printed the image directly onto the dp from the Prima 6x6 stack Fairy Flora, then painted it with Twinkling H2O's. the finishing touch was a feather stitch rub-on down one side. There are some fabulous releases this week - please feel free to follow the links on my side bar to see the other releases by the design team. Welcome and thanks for visiting - it's great to see you here. The other day I was given a copy of the latest Papercrafts magazine, and was inspired by a card by Laura Pryor, where she scribbled on water-colour paper, and then misted it with water. The card base was randomly stamped with a large snowflake stamp and Versamark. The feature panel was made with water colour crayons scribbled on water colour paper and spritzed with water, and then sprayed with silver Glimmer Mist. One edge was torn to add texture. The twine I used is from Layers of Color, and is somewhat different being purple with a gold strand through it. I added a sentiment panel which was raised with a pile of foam dots. The buttons were adhered with glue dots. This last photo shows some of the glimmer on the feature panel. Thanks for visiting - may your day be blessed. Welcome back - It is always great to know you have visited. I painted the image using my newly acquired distress inks. Layered it onto some purple mulberry paper I had frayed the edges of, and then onto the pink base. I adorned the panel with rhinestones and more stickles, and added a wee ribbon and bow to finish it all off. Love the sparkle this brings to the card. There have been many more images released this week, and a freebie, so wander around the other team members (links in my sidebar) to see the wonderful work and pick up the freebie. Welcome again - it's time for the new releases from McMahon Five Design. I love the dreamy expression on this wee dancer's face. The stamp is by L'Amour Allure and is called Ballerina. I paired her with paper from the Lilybee Designs Head over Heels 6x6 stack. She was coloured with chalks and had some Stickles added. The corner embellishment is three die cuts from the Floral Doily Motifs, layered and with a Prima Rose over some lace from my stash. All the layers were distressed and sponged, and three wee hearts completed the card. I have succumbed to Bridget's prodding again and have shared my work desk. There is no project on it, as I had finished and tidied up. There are an experimental couple of strips on the top left of the desk pad that still has to be finished. I liked the effects on my scratch paper from all the sponging I have done, so I took a close-up of it. The five squares of colour on the top is where I tested the colours on a rainbow pad, trying to find the 'right' brown - there are also smudges of brown down the side from the same quest. So that is my desk, Bridget, and it is still Wednesday. Thanks for popping in - may your day be blessed. Welcome back to my wee corner of blog-dom. The sentiment was stamped with versamark and then distress ink layered on the stamp, and then clear embossed. I used the same ink to sponge all the edges, so it was the best fit. The background paper is a slightly textured cream paper from a "child's craft pad" . The ribbon which shows clearly here appears clear but has an iridescent gleam to it in bright light. Mama chook and her chicks were all coloured with chalks, as was the sky. The 'grass' is actually the torn edge of a strip of mulberry paper. Welcome back - this post is my second for this week releases from McMahon Five Design.com. There is a lot of sparkle on this card that the camera did not pick up. The image was printed out on Cryogen curious metallic paper which has a subtle sheen that shows through any medium, and painted with twinkling H2Os - don't you love his crooked wee smile? Here is a close-up of the balloon, and I highlighted it with some crystal stickles, which were also used on the balloons on the designer paper. The final touch, which proved to be the most difficult, was to layer the image over these sheets of shiny 'holes'. They show purple IRL, but the camera picked up a more aqua tone :-(. Thanks for calling, and please feel free to be inspired by the rest of the Design Team at McMahon Five Design.com - the links to their blogs are all in the sidebar. Thanks for visiting today - it is always nice to know you have called by. The image I have used for this post is called Whimsy, by LS Designs, a new line being carried by McMahon Five Design.com. I printed the image onto a cream card and coloured her with chalks and twinkling H2O's. The card was sponged with distress inks. To add some interest I painted over the coloured frock with sparkle glue paint. The image was then mounted over some textured and embossed paper I found in my stash. A bow and tear drop gems were added to finish the card after mounting it on red card stock. I am posting another card from this release shortly - also please also feel free to visit the other team members for some awesome inspiration this week. This card is a case (Change and Share Everything) of her card, and the inspiration for her card which is here. I changed the sentiment style and mounted it on a small piece of card I had sponged the edges of. The stripes are wound around another layer of card, (also sponged on the edges)and were made of embroidery cotton and a silver thread crocheted together. There were three rhinestones added to mirror the silver thread in the stripes. A final few with the light catching the silver. This is my second post for the day, please scroll down for the other one. 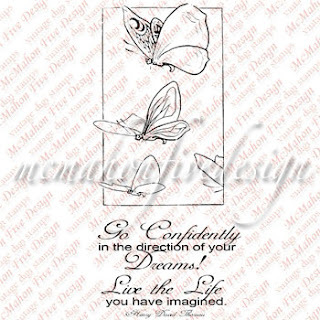 Sue over at McMahon Digital Vintage has just released this beautiful butterfly set. The set is entitled Go Confidently, as there is a sentiment that goes with it. The sentiment was not available when I made my card, so I added this stamped one from the D'Amour Allure Wishes of Love Acrylic Set. The design paper is from the Lilybee pad Head over Heels and picks up a lot of the other colours in the card. There are a lot of new designs this week, and a new designer ,over at McMahon Five Design - do pop over to the blog to catch up with all the news. Thanks for visiting again - may your day be blessed. Greetings – thank you for visiting today. I loved this new image from McMahon Digital Stamps as soon as I first saw it and enjoyed making this card.... and I have been humming the tune too. The image was painted with Twinkling H2Os. I chose to fussy cut around the image and cut the printed string off, and punch holes and thread some narrow ribbon through them instead. This was then mounted over the die cut and a few pearls added to finish. Sarah Hurley Challenge #59 - Love is All Around. Thanks for visiting – may your day be blessed. This post is the result of a challenge from a friend named Bridget - hence the title. Bridget takes part in a weekly challenge called Whats on Your Workdesk Wednesday, and last week I commented on her post that I had tidied mine, so I was promptly challenged to show! Here is the floor behind my desk - the 'stuff' has retreated thanks to the re-organisation! There you go Bridget :-) Challenge taken.